Last month, a California grape farmer was fined $10,000 for using a pesticide in violation of the label, then packing and attempting to sell the tainted fruit. DPR detected the residues of a pesticide on the produced that was not registered for use on grapes. Cases like this are rare in California but remind growers how important it is to apply pesticides correctly by following all pesticide label directions. 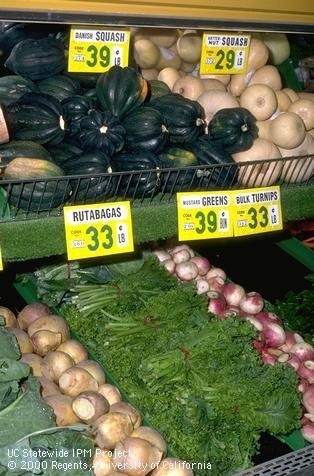 The California Department of Pesticide Regulation (DPR) runs the most extensive Pesticide Residue Monitoring Program in the nation and is hard at work ensuring that the fruit and vegetables we purchase and consume are free from illegal pesticide residues. 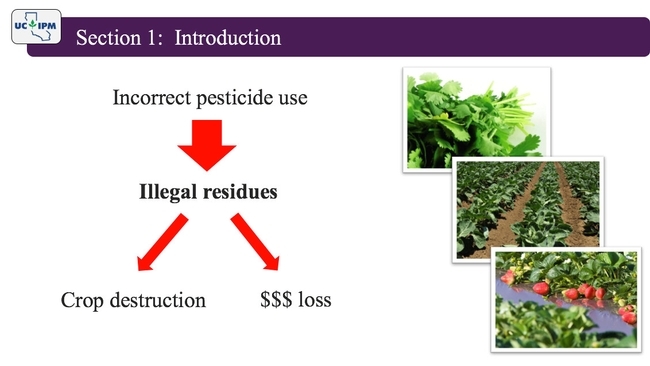 New online course from UC IPM presents information on illegal pesticide residues. 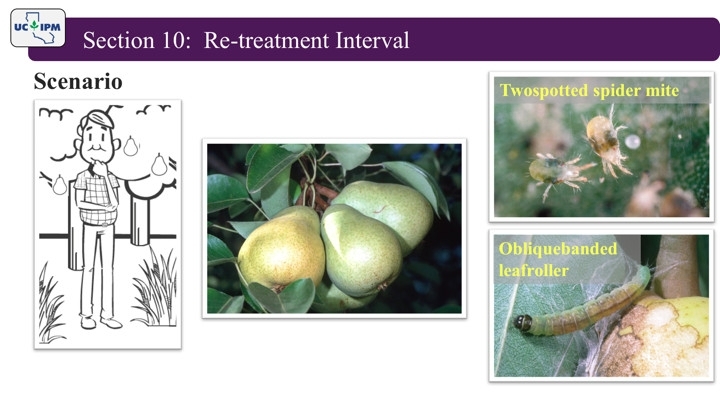 Understanding and following label instructions is the focus of a new online course developed by the University of California Agriculture and Natural Resources Statewide Integrated Pest Management Program (UC IPM). Scenario screen from the course. 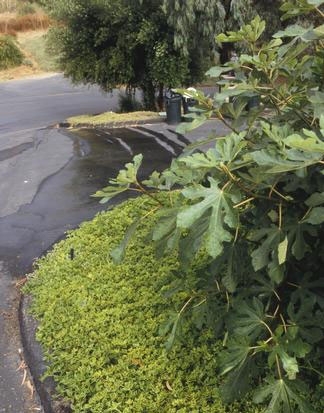 Proper Pesticide Use to Avoid Illegal Residues is published just in time for pest control advisers and pesticide applicators who are still a few units short to renew their licenses or certificates with DPR. The course has been approved for two hours of Pesticide Laws and Regulations continuing education units (CEUs) from DPR and costs $40. If you don't need CEUs, but are still interested in viewing the course content, check it out for free on YouTube. DPR recommends that renewal packets be submitted before Nov. 1 in order to receive your renewed license or certificate by Dec. 31, as the processing time can take up to 60 days. For additional online courses that UC IPM offers, visit the online training page. 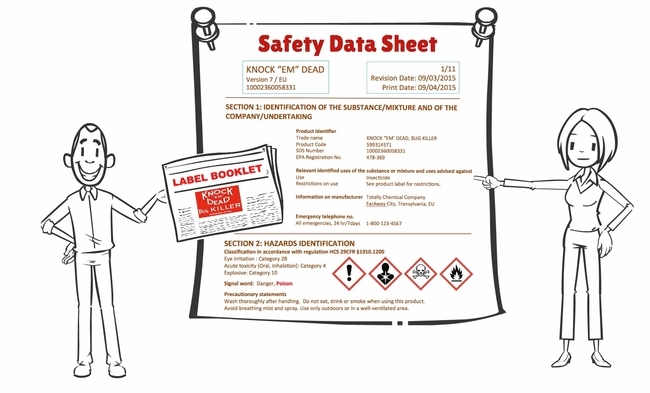 One of many screens in the course showing an animated sequence of a safety data sheet. A strong pesticide regulation program and pesticide applicators that follow pesticide labels can assure consumers that produce is free of pesticides and safe to eat. As consumers, we put a lot of care into the food we buy. We tend to trust that the produce we purchase at the local grocery store is free of pesticides and safe to eat. 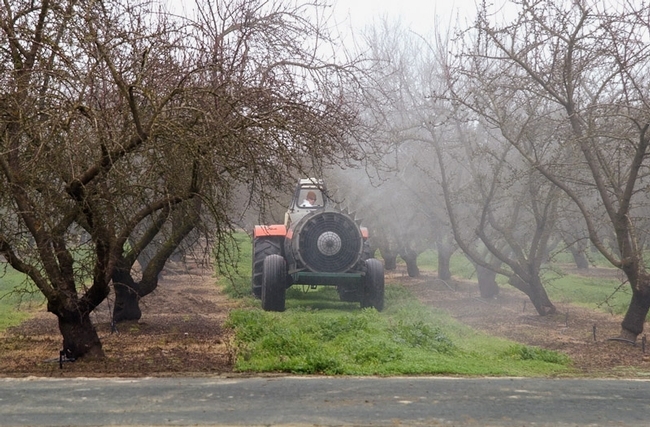 In its latest report from 2013, the California Department of Pesticide Regulation (DPR) reported that there was little or no detectable pesticide residue in 97.8 percent of all California-grown produce. This demonstrates a strong pesticide regulation program and pesticide applicators that apply pesticides safely and legally. However, there have been instances in California where a pesticide not registered for a specific crop has been used unintentionally, resulting in illegal residues and eventually crop loss and destruction. The Environmental Protection Agency sets tolerances for the maximum amount of pesticide residue that can legally be allowed to remain on or in food. Following pesticide labels helps applicators avoid illegal residues. The primary way pesticide applicators can assure that they make proper applications and avoid illegal pesticide residues is to follow the pesticide label. 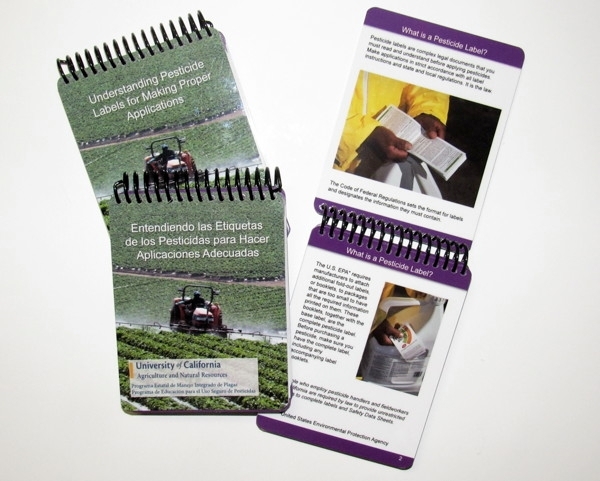 The UC Agriculture and Natural Resources Statewide Integrated Pest Management Program (UC IPM) put together a 26-page card set in English and Spanish on understanding pesticide labels. Although intended primarily for pesticide handlers, applicators, safety trainers, and pest control advisers, these cards can be useful for anyone who applies pesticides in urban or agricultural settings. 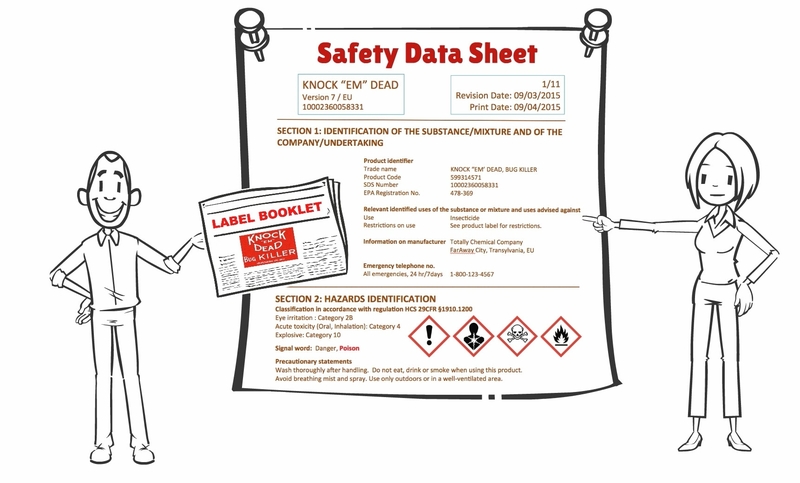 The cards explain when to read the label, describe what kind of information can be found in each section of a pesticide label, and point out specific instruction areas that will help applicators apply pesticides safely and avoid illegal pesticide residues.